MOUNTAIN VIEW, Calif.--(BUSINESS WIRE)--The 40-hour work week may be alive and well, but it looks nothing like it did a generation ago – at least not if you’re part of the growing ranks of people dipping a toe in the on-demand economy. 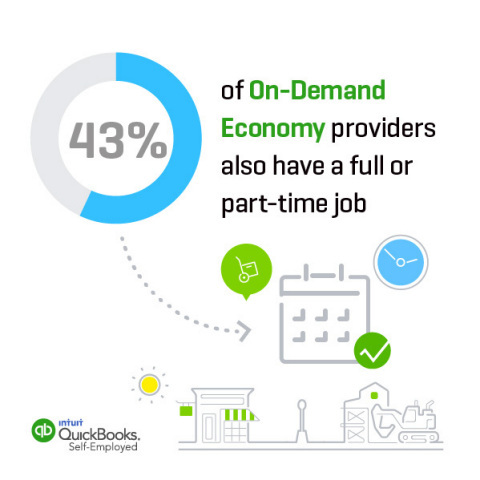 A new study from Intuit Inc., “Dispatches from the New Economy: The On-Demand Workforce,” shows that on-demand economy workers average 40.4 hours per week, but rely on three different sources of income to make up their entire paycheck. The typical work week includes a mixture of: on-demand work (34 percent), a traditional full or part-time job (30 percent), contracting and consulting (19 percent), and running a business (14 percent). The new data comes from a study from Intuit Inc. (Nasdaq: INTU) and Emergent Research that examined people working via eleven on-demand economy and online talent marketplace companies. Study participants included: Deliv, Field Nation, Fiverr, HourlyNerd, MBO Partners, OnForce, Uber, Upwork (formerly Elance-oDesk), Visually, Wonolo, and Work Market. The study found that most people working in the on-demand economy are satisfied, while key challenges focus on finding enough predictable work. 91 percent of people working on-demand jobs report that they like controlling decisions about where, when and how they work. 70 percent of on-demand workers are satisfied with their work arrangement. 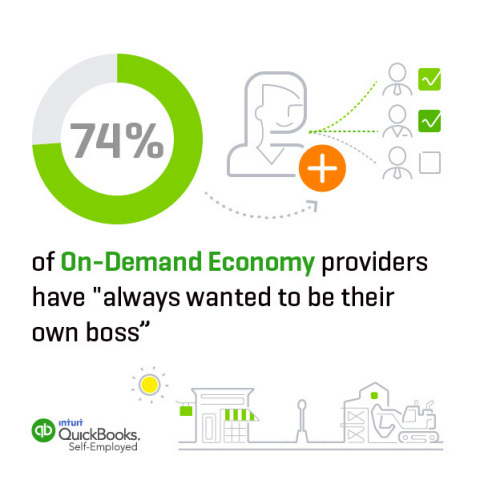 People working in the on-demand economy are well represented across Millennial, Gen X and Baby Boomer generations. The vast majority are well educated, and men outnumber women. Feb. 1 is the deadline for businesses to send 1099-MISC forms to self-employed people. For many people working in the on-demand economy, this represents the first time they are confronted with a new set of tax obligations. 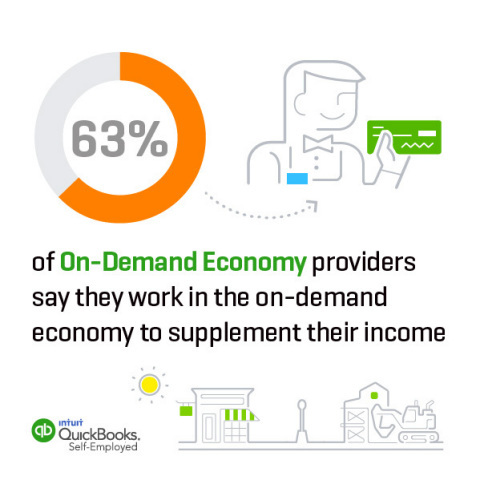 Intuit’s QuickBooks Self-Employed product provides tax relief by helping on-demand workers manage business and personal finances, handle taxes throughout the year and meet compliance requirements. A total of 4,622 workers who find work opportunities via the platforms provided by the participating partner companies completed an online survey between September 11 and October 1. The results were weighted to reflect the proportion of workers in each of the following segments: Drivers/Delivery, Online Talent Marketplaces and Field Service/Onsite Talent. The weights were developed using earlier survey work that sized the on-demand economy. The largest weighted share of on-demand worker respondents from any single company is 16 percent, with most partner companies providing less than 10 percent of the respondents. Please find study highlights here.